Everyone desires a bright smile. That is why we, at Smile care Valencia, are dedicated to helping people achieve this desired gift. 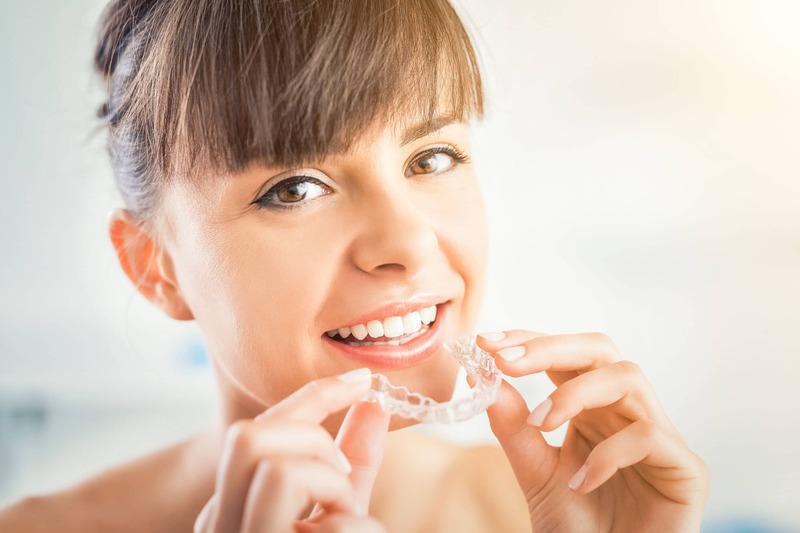 From the introduction of Invisalign aligners, Santa Clarita people are having huge success solving their teeth alignment problems and getting that coveted bright natural smile. Earlier technologies used metal braces to help patients with crooked and misaligned teeth. The braces were metallic brackets linked with wires and fitted on the teeth to move them to the desired positioning. Invisalign has introduced clear aligners which are tight fitting mouth wear that the patient slips into their teeth for the treatment process. They are much more comfortable than metal braces, and they have become quite popular in the market. Not everyone is fit for Invisalign clear aligners. A visit to our practice will include consultation with our dentist who after inspecting your teeth will tell if you are suitable for the procedure. Invisalign clear aligners are more appropriate for teens and adults than kids. This is one consideration that the dentist makes before recommending the procedure. Aligners are designed for a tight fit on the patient’s teeth, and since a kid’s dental formula is still developing, the aligners would cause major discomfort for them. Patients with crowded teeth and gaps between teeth are the best candidates for Invisalign aligners, and after the in-clinic procedure, they are sure to leave showing off their new smile. Other candidates for the procedure are individuals with severe cases of over or underbite, and crossbite. When the dentist determines that you need aligners, they will go to creating a plan for your treatment process. The will make different versions of aligners which are to be worn during the various treatment stages. The Invisalign clear aligners Santa Clarita move your teeth through many slight adjustments, and the patient has to change the aligners weekly or per fortnight as per the dentist’s prescription. It is important for the patient to be diligent in wearing the aligners. For the best outcome, the patient can wear them for up to 20 hours daily and should only remove them when it is completely necessary. A good example is when brushing the teeth or while taking food and drinks. The time of treatment varies from each patient. The period the patient wears them depends on the severity of their case and how much the teeth need to be moved to get the desired effect. For most cases, the effect is achieved in 10 to 24 months. However, for adults that wore braces as kids and had their teeth slightly moved, the procedure can take as little as 3 months. The major reason why Invisalign aligners are better than braces is their clear color. No one wants everyone knowing that they are wearing braces and with clear aligners, one can smile without worry. Aligners do not give patients a metal mouth which is as uncomfortable as it is unappealing to the eye. Besides this Invisalign aligners are removable so the patient can brush and floss their teeth at will thus maintaining oral hygiene. This is all the more reason why clear aligners are the preferred option.